PC controlled RF synthesizer for immunity testing matched to the requirements of IEC61000-4-3 and featuring automatic scanning to pre-programmed schedules. To make the best use of the immunity test facilities for both compliance testing and product investigations, several useful features have been developed. Powerful EUT monitoring with real time display correlated to field strength and frequency. Sweep can be continuous or 'pause on fault' or 'stop on fault'. Additional EUT excitation output, either pulsed or continuous. Flexible single frequency search mode. Automatic ramping of field strength and fine control of frequency. The system is controlled from any PC via a Windows software package and serial port. No additional interface cards are required. The RF1000, RF2000 and RF3000 RF Synthesizers (immunity test controllers) include a signal generator matched to the RFI immunity requirements of IEC61000-4-3. Features such as sine and pulsed modulation, programmable start and stop frequencies, frequency step, and dwell time are provided as standard. RF impulse generator covering the frequency range of 11 Hz to 1 GHz. The IG-1700 may be used as a calibration source for the R-110B or other wide range receivers and may be integrated into the DSI-110, DSI-120, DSI-2020 and DSI-200 systems. It provides impulses at repetition rates and amplitudes selected by front panel controls or via the IEEE-488 bus. The IG-1700 features an uncomplicated front panel with discrete LED displays to indicate the pulse repetition rate and the actual output amplitude in dBuV/MHz at 100 MHz. Provision is made for pulses to be triggered by an adjustable internal time base (manually, externally, or by the AC line). Pulse repetition rate and amplitude may also be programmed via the IEEE-488 interface bus. 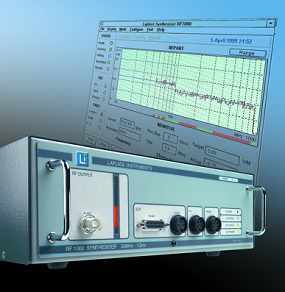 Calibration curve is supplied providing amplitude referenced to 100 MHz. Separately controllable vertical and horizontal synchronization channels. Many signals that defy analysis by other means can be understood by an operator when presented in a visual format. The RG-1000A Raster Generator makes this possible. This instrument contains a unique combination of digital and analog circuitry that allows conversion of almost any repetitive electronic signal into a pictorial display. While raster generators are commonly used for recovery of signals that are similar to television transmissions, many other applications are possible. EMI evaluation and telemetry monitoring are two examples. The RG-1000A provides an X-axis range of 100 Hz to 500 kHz, and a Y-axis range of 20 Hz to 2 kHz. Either output may be made to track the other at a user selectable ratio, or tuned or set independently. All frequencies are precisely synthesized from a master clock, and an added vernier circuit allows continuous fine tuning. Adjustable gain, offset, blanking, and selectable signal inversion are provided for the Z-axis (video) channel. IEEE-488 bus control of all functions is a standard feature. 5.25 x 17 x 18 in. 133 x 432 x 457 mm.